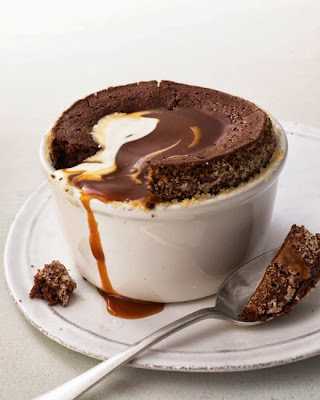 These rich chocolate cakes have a soft center that partners well with the caramel topping. Bake until center of a cake is soft but not wet when pressed, 27 to 30 minutes. Let cool 5 minutes. Serve cakes warm, topped with caramel and whipped cream. For the best texture, don't overbake the cakes. Lightly coating the ramekins with sugar helps the cakes rise as they bake and makes them easy to unmold before serving, if you like.